How Temporary is a Temporary Order? During your divorce, some issues between you and your spouse are time sensitive and must be addressed before you reach a final settlement, or the court enters a final ruling on your case. Who gets to stay in our home? What will parenting time look like between us? What amount of child support or alimony will either of us pay? Who will be responsible to pay for our family’s health insurance coverage? When spouses are unable to reach agreement on time-sensitive matters, either spouse may ask a court for a temporary order to decide these issues. When does a temporary order end? A court approves your final agreement, or a court enters its final order after a trial. A new temporary order is entered by the court, which supersedes the first temporary order. Although a temporary order is not permanent, it is important to understand the lasting impacts that a temporary order can have on your case both during and beyond your divorce proceedings. How can a temporary order impact my case? Temporary orders sometimes give you an idea what a court’s final order could look like in your case. If a court has awarded equal parenting time between you and your spouse on a temporary basis, it is likely that similar parenting time would be in a final order unless significant new facts are brought to light. Conversely, temporary orders also serve as important trial-runs. If a court temporarily awards one spouse a significant amount of parenting time, but that spouse routinely fails to exercise that parenting time, then the court may be less inclined to award the same amount of parenting time in a final order. Finally, temporary orders can influence the willingness of spouses to negotiate settlement agreements. If one spouse receives a favorable outcome from a temporary order, then that spouse may now have less incentive to timely negotiate a settlement. 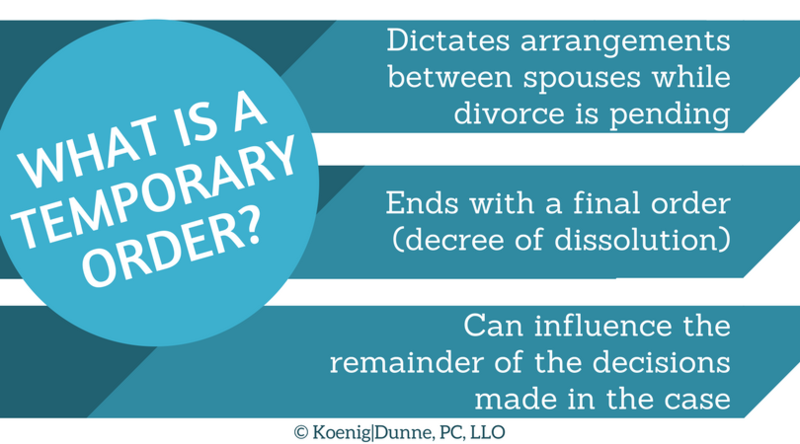 Your Koenig|Dunne team understands the impact that a temporary order can have on your case, and we are here to help you navigate this critical juncture in your divorce.